Uzumaki (うずまき, Spiral) is a 2000 Japanese horror film based on the manga of the same name. The film was the featured film debut of Akihiro Higuchi under the alias of Higuchinsky and stars Eriko Hatsune, Fhi Fan and Hinako Saeki. The film is about a town infected with malevolent spirals. The film was backed by Omega Micott, who released the film simultaneously in Japan and in San Francisco to create hype around the film on the Internet. Reviews praised the film's visuals but commented that the film was not entirely effective in being frightening. The film consists of four parts ("A Premonition", "Erosion", "Visitation", and "Transmigration"). High school student Kirie's first glimpse that something is awry in the small town of Kurouzu comes when the father of her boyfriend (Shuichi) begins to film the corkscrew patterns on a snail; he is also in the process of making a video scrap book filled with the images of anything that has a spiral or vortex shape to it. His weird obsession threatens to go out of control. He proclaims that a spiral is the highest form of art and frantically creates whirlpools in his miso soup when he runs out of spiral patterned Kamaboko. He then becomes one with Uzumaki when he decides to crawl into a washing machine to get a 'point-of-view' shot for his film. It is not long before the entire town is infected by the otherworldly whirls. Tamura, a reporter, is intrigued by Shuichi's dad's suicide and becomes obsessed with the case. Meanwhile, in the hospital, Shuichi's mother, who was hospitalized after her husband's death, cuts off her hair and fingertips in order to get rid of anything spiral-shaped on her body, and grows so afraid of spirals that Shuichi is forced to tell the hospital to eliminate anything spiral-shaped so his mother may not encounter them (even going so far as to throwing away the cakes that Kirie had brought for her mother, since the frosting on the cakes were like whirls). Eventually, Shuichi's mother succumbs to her phobia and kills herself when a millipede tries to crawl into her ear to inhabit her cochlea and causes her to hallucinate about her husband, who tells her that "there's another vortex in the deepest part of your ear". Meanwhile, Kirie's high school is populated by a host of twitching teachers, preening pretty girls, and the slimy Katayama, who begins to walk at a snail's pace and only comes to school when it rains. Making matters worse, the student body is starting to sprout shells, drink water in copious amounts, and crawl on the walls of the school. Kirie's classmate, Sekino, begins to grow her hair in medusa-like curls that eventually take over not only her mind but the minds of all the girls in the school (save for Kirie). It is not long before even the sky itself is cursed, with whirl-like clouds and the eerily smoky, ghost-like faces of the victims who perished in the grip of Uzumaki appearing during funerals. Soon, everyone in Kurouzu has been caught in the curse of the vortex—Kirie's dad, who takes a drill to his eye after obsessively creating spiral shaped ceramics; the reporter who gives a special report on the horrors of the town and her crew, all of whom lose themselves in a tunnel only for their corpses to be found as snail-people; Sekino, whose chokes and her body has been and devoured by the snake-like curls; Kirie's stalker, who throws himself in front of Inspector Tamura's car and is twisted around the axle, the impact by Tamura's head leaving a spiral crack in the windshield; a police officer, who while he was admiring the spiral rifling in the barrel of his gun, shot himself in the eye, leaving a spiral hole in his head; and even Shuichi himself, whose body twists into a spiral and becomes possessed by it. Only Kirie is left in the cursed town of Kurouzu, and, in the end, her final fate is unknown as to whether or not she lives or dies. Hinako Saeki as Kyoko Sekino. Uzumaki is based off the manga Uzumaki by Junji Ito. Ito had stated that for most of his stories, he starts with a visual image and builds a story around the picture. For Uzumaki, he had a different inspiration of wanting to make a film about people who lived in a traditional Japanese row-house and seeing what happened. When drawing the row-houses, he found himself drawing a very long house that coiled into a spiral to fit on his page. The film was the debut feature for director Akihiro Higuchi under his alias of Higuchinsky. While filming the television series Eko Eko Azarak, director Higuchinsky met Kengo Kaji who he proposed the idea of making a film to. Higuchinsky stated that he originally wanted to make a film like Star Wars but realized that "because I'm Japanese, I should do something different." Higuchinsky had been reading a manga magazine compilation which contained Ito's Uzumaki. Higuchinsky thought the manga was brilliant and asked Kengo Kaji to adapt the film finding out that the film was already in the process of being made into a film and that producers were looking for a director. Higuchinsky described the lure of Uzumaki using the Japanese word kikai which translates to strange and mysterious things or people, and that "the allure of Uzumaki is not that the uzumaki itself is scary but rather the changes in the people caught up in it. " The original production of the film was going to be an independent production and would be part of an anthology film, but during production Toei Animation decided to have it become a bigger film. The film was backed by Toyoyuki Yokohama's Omega Project, a company that married Japanese and foreign funding to make J-Horror films for an international market. The company had previously had popular films with Audition. Higuchinsky desired to be faithful to the manga as possible. At the time, the manga had not been completed yet. To help his crew express a Japanese style in the film, he had his staff watch Akuma no temari uta. The film was primarily shot in Ueda City with a few locations in Tokyo. Higuchinsky said the film was shot in about two weeks. Uzumaki was released in Japan on February 11, 2000. It was released as the first half of double bill with Tomie: Replay. The film was released co-currently in the United States as it was in Japan with a limited run in San Francisco. Omega's vice-president Akiko Funatsu stated that San Francisco was chosen due to "all the internet activity there". The film was shown at the 2000 Fantasia Film Festival. On Rotten Tomatoes, ''Uzumaki the film has a rating of 54%, based on 24 reviews, with an average rating of 6.1/10. On Metacritic, the film has a score of 62 out of 100, based on 9 critics, indicating "generally favorable reviews". The New York Times noted the way the film develops mood, finding it part of the cycle of Japanese films like Kiyoshi Kurosawa's Cure and Hideo Nakata's Ring as "vivid, state-of-the-art scare films that move so swiftly that psychological underpinnings are a luxury". The review concluded that in the film that "things really get weird, though not particularly scary" and concluded that the film as "ultimately disappointing". Variety described the film as "intriguing, if ultimately unsatisfying" noting that despite the eccentric and supernatural phenomenon of the plot, the film did not sustain atmosphere or build a sense of dread between set pieces. The review concluded that horror fans would appreciate the film's offbeat concept and visuals, while praising the film's cinematography and soundtrack and finding the film hobbled by its "typically bland, schoolgirlish heroine." The Oregonian described the film as "beautiful, cold, oddly colorful and just plain otherworldly" and also that it contains "many creatively terrifying and effectively gross sequences that stand on their own beautifully." The review also noted that the film isn't perfect, as it was creepy but not horrifying, stating that "the film doesn't flow into a consistent building of terror" and that it was "too atonal to gain momentum". Film Threat found that the film wasn't as effective as Ring, but deserves to be watched as it was the apex of J-horror. The review praised the sound design and cinematography stating that these elements did "most of the work". The review concluded that Uzumaki would be "destined to be forever forgotten by American audiences...some kid won't accidentally come upon it and scare the crap out of himself. And that's just sad." The A.V. Club noted the style of the film, opining that kinetic shooting style doesn't pause for anything; like a lot of music-video and commercial directors, his achievement is better considered shot-by-shot than as a whole." AllMovie gave the film a three and a half star rating out of five, concluding that it was a "visually imaginative and engagingly offbeat horror film, but its willful goofiness and unresolved story line doesn't offer much in the way of psychological resonance." Higuchinsky stated that after the films release he sometimes receives fan mail from Europe which made him particularly happy as it was his "dream to use film as a way to overcome national borders and have my movies watched by people all over the world. I think that these fans focus not on the story but on the simple images, they sense something through the visuals." ^ a b c d e Kalat 2007, p. 280. ^ a b c d e f g Harvey, Dennis (April 24, 2000). "Review: 'Whirlpool'". Variety. Retrieved February 18, 2016. ^ a b c Mitchell, Elvis (May 1, 2002). 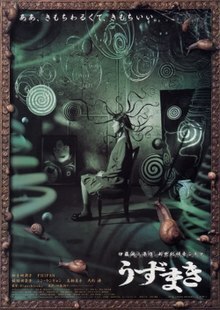 "Uzumaki (2000)". New York Times. Retrieved February 18, 2016. ^ a b c d Kalat 2007, p. 90. ^ Kalat 2007, p. 86. ^ a b c Kalat 2007, p. 87. ^ a b c d e f g h i Edwards 2017, p. 177. ^ a b c Kalat 2007, p. 91. ^ a b Edwards 2017, p. 179. ^ "Movie Listings 2000". Fantasia Film Festival. Archived from the original on October 6, 2001. Retrieved February 18, 2016. ^ "Uzumaki". Rotten Tomatoes. Retrieved February 19, 2016. ^ "Spiral reviews". Metacritic. Retrieved February 19, 2016. ^ a b Morgan, Kim (May 31, 2002). "'Uzumaki' a spiral of scary freakiness". The Oregonian. Archived from the original on July 11, 2002. Retrieved February 19, 2016. ^ a b c Williams, Ross. "Uzumaki". Film Threat. Archived from the original on August 12, 2002. Retrieved February 19, 2016. ^ Tobias, Scott (October 7, 2002). "Uzumaki". The A.V. Club. Retrieved February 19, 2016. ^ Ralske, Josh. "Uzumaki (2000)". AllMovie. Retrieved February 19, 2016. Edwards, Matthew (2017). Twisted Visions: Interviews with Cult Horror Filmmakers. McFarland. ISBN 1476663769. This page was last edited on 29 March 2019, at 13:11 (UTC).